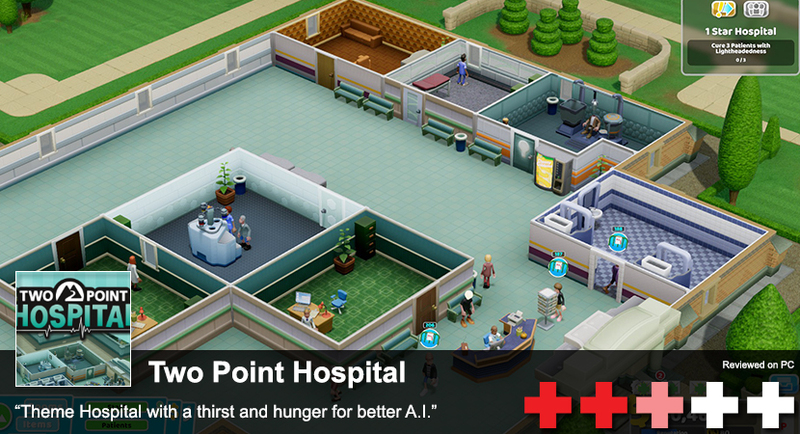 Two Point Hospital is the spiritual successor to Bullfrog's Theme Hospital in which you manage a series of hospitals. Theme Hospital and Two Point Hospital aren't typical business management simulators either. They have a cartoonish presence that makes the games feel more fun than stressful, even though running these hospitals can get very stressful at times. Two Point Hospital is more stressful though, and that's because it's broken. 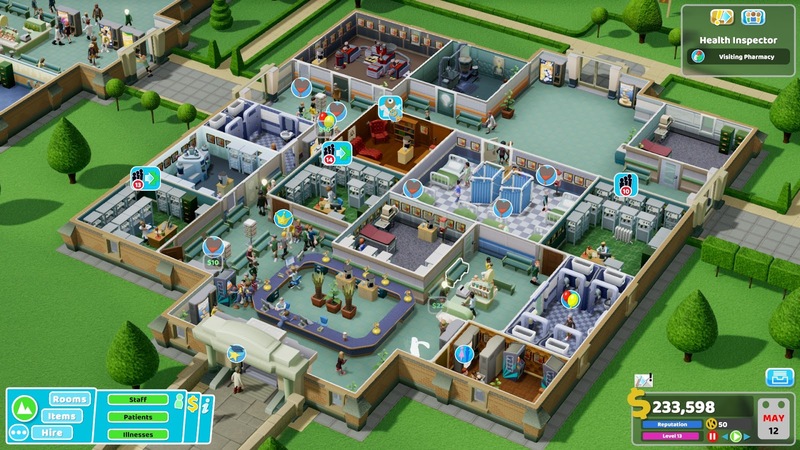 If you're planning on buying Two Point Hospital in its current state, be warned, the AI is a mess and that makes it more frustrating than enjoyable once you get through several levels. The path-finding is horrible and makes the game unpleasant to play. 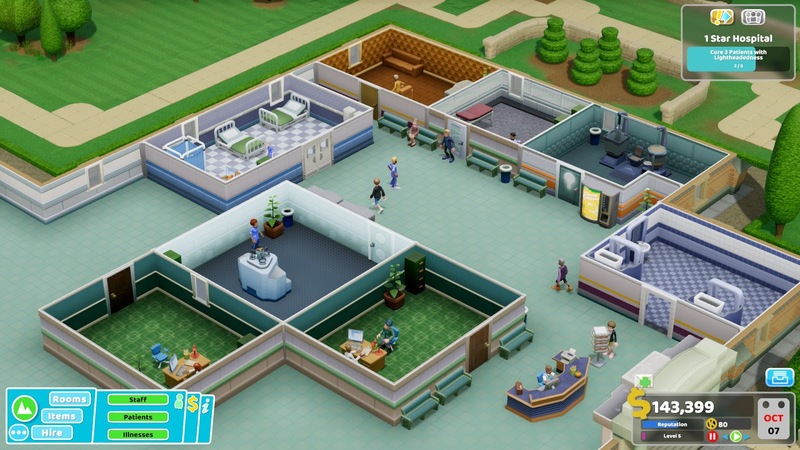 If you build corridors that are tightly packed together, like you would in Theme Hospital, your patients and staff have difficulty navigating through them. This causes groups of people to bunch up in areas, meaning other people can't get past them. It just turns into a clustered mess. A solution for them to quit standing around is to place benches nearby, but my patients rarely used them, even if the bench was right in front of them. There's several other problems with the AI that don't make a lot of sense either. You can place as many snack and drink machines as you like, yet the biggest complaint I get is how thirsty and hungry everyone is. They'll pass by several machines while storming around the hospital complaining. Then there are the toilets. I was so frustrated in one level that I created the biggest bathroom area I could yet somehow, they still were "looking for toilets". One of the other glaring problems with the AI is that when a patient is done being diagnosed, some will just get back in line to be diagnosed again. The solution I found to get around this was just manually clicking the patients and sending them for treatment. You can have 5-6 GPs offices and still have 15+ patients waiting outside each one while the rest of your hospital is doing nothing at all. In it's current state, Two Point Hospital is flat out broken, which is sad because beneath the problems lies a terrific follow up to Theme Hospital, a personal favorite game of mine. It's not all bad though. All of the charm of Theme Hospital shines through in Two Point Hospital. The graphics are very appealing like its source material. Character models are funny looking in a good way, the UI and layout both look nice, and the game runs pretty smoothly overall. There is good attention to detail, such as laying down a SEGA arcade machine and seeing some Hill Zone graphics run across its screen. The same goes for the sound department. The first time I heard the announcements blast across my hospital, I had a nostalgic flashback to the 90s and Theme Hospital. The music is also relaxing for such a stressful job. Part of the charm from these series are the hilarious diseases that people walk in with. Lightheaded disease is someone with a light-bulb for a head. The cures are sometimes equally funny. One surefire way to cure pan head is to use a giant magnet to rip the frying pan off the patient's head. Why so many people get pans stuck on their head is another issue. Floor plan placement is key for a nice looking and effective hospital. You have a minimum number of tiles to use for each room you place, and then you build up the prestige ranking of each room depending on what you're able to place in that room. Currently, this system is broken however, as you can spam gold certificates on the wall to maximize prestige with ease. And you can ensure you're always in that 90 percentile of effectiveness by placing bonus items all over the room, squeezing your doctors and nurses into a tiny area to work. But you can customize the room any way you want with whatever items you really want. Want an arcade cabinet in the psychiatrist's room? Go for it. The noise will drown out your crazy patients ramblings. Staff is critical in these games but seems a bit more manageable due to the amount of training you can provide. Have a grumpy worker? Throw them in the education camp and make them learn how to be jolly. You can create jack-of-all-trade doctors and nurses, or just have them specialize in one discipline. Each hospital you run has a rating system that needs to be maxed to unlock bonus rooms and upgrades for your hospital. There are 3 stars you can obtain but they're all mainly a grind. The only rating requirement that is really hard to maintain is the happiness level due to the current NPC issues. The problem allowing the hospital to run portions of the game is you can't fail. You can't go bankrupt and lose. Instead, you just continue losing money for your hospital without any true consequence. It takes a lot of the challenge away and makes each level just feel like a complete sandbox. If they manage to patch the AI and fix it, I'd recommend Two Point Hospital but in its current state I'd stay away. Once the AI is fixed, this is a perfectly fine business simulator and a lot of fun to play.